Guitar amp modeling plug-in wth 18 models for all styles, 20 cabs, effects, and more. 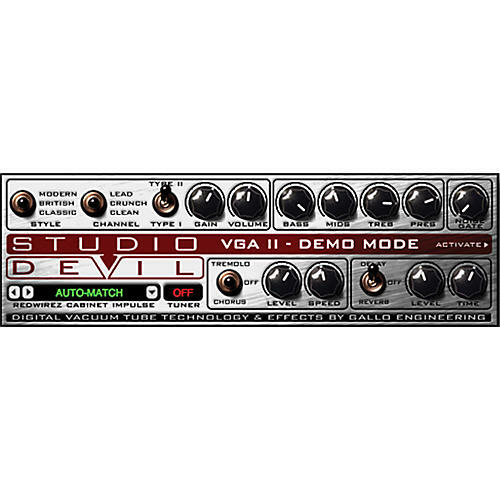 This is the downloadable version of Studio Devil's Virtual Guitar Amp II, the first major update to their award-winning VGA guitar amp modeling plug-in for VST, Audio Units, and Pro Tools RTAS compatible hosts. Studio Devil has teamed up with Red Wire Impulses to include 20 cabinet models from their world-renown Redwirez cabinet impulse collection. Matching these great cabinets with improved tube preamplifier models utilizing Studio Devil's proprietary vacuum tube modeling algorithms, some stunning effects, and a built-in tuner, all make Virtual Guitar Amp II one of the most versatile guitar amp plug-ins available. Studio Devil's "auto-match" cabinet feature automatically selects the best of 20 cabinet models based on the user's choice of preamp style, channel, and type, making it easy to find the perfect tone. Manual selection of the speaker cabinet is also provided, giving the user instant access to 360 different tonal combinations. This, along with authentically modeled gain knob and tone controls, provide limitless tonal options from one, simple, and compact user interface. Give your axe some more tones to grind on with this amp modeling software. Download today!